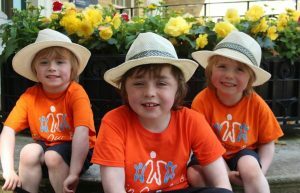 Hello our names are Archie, aged 9 and George & Isaac, aged 5 and we are three brothers from Ireland who have DMD. We love each other very much and love life. We have had a wonderful summer; we were in the UK for two weeks and it was great fun. 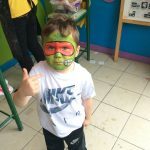 We went to Lego land and Poultons Park and the sea Side – it was brilliant. We are very lucky to live in an amazing community in the west of Ireland who are doing everything they can to help us raise awareness of DMD. We are hoping that a medicine can soon be found that will help every child and adult living with the Disease. Archie: I want my muscles to work properly as when I grow up I want to play Rugby for Ireland and be a drummer in a rock band. George: I want the doctors to find a medicine for my silly muscles because when I grow up I want to be a Chef. Isaac: My muscles are too slow! I want to run faster and faster! When I grow up I want to be a Bin Man! 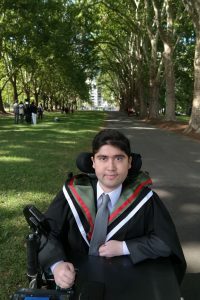 My name is Savant Thakur, I live in Melbourne, Victoria, Australia and I was diagnosed with Duchenne Muscular Dystrophy (DMD) when I was 4 years old. Although I lost my ability to walk at the age of 10 and have progressively lost most of my upper limb strength, I have never let this come in the way of achieving my goals in life. In fact, my medical condition has been a great motivation. Since childhood I have been fascinated by the molecular processes that go wrong in DMD and always harboured an ambition to find a cure for DMD by correcting these defects. This desire was reinforced further during my frequent trips to the Royal Children’s Hospital (here in Melbourne) as a young boy, where I experienced first-hand the wonderful work done by world-leading medical specialists, allied health clinicians and medical researchers. Over the years I have become more and more determined to reach my goal and this one-eyed determination has given me the courage to fight through the adversities and medical complications to excel academically at school and university. In 2013, I graduated from The University of Melbourne with a Bachelor of Biomedicine degree and subsequently completed my honours degree last year (2014) with exceptional grades. Currently I am in the first year of my Ph. D, which I am undertaking at the Basic and Clinical Myology Laboratory, headed by Prof Gordon Lynch (a world renowned muscle expert) at the Department of Physiology, The University of Melbourne. I can proudly say that I am living my dream as a biomedical researcher, performing research to discover novel treatments for muscle wasting disorders that will improve the quality of life for individuals affected by DMD and other related conditions. Outside the professional medical research sphere, I have a strong passion for promoting awareness of DMD research in the general public, across media circles and funding bodies. My other interests include watching sports – Australian rules football (I am an avid Western Bulldogs supporter) cricket and soccer, viewing science and war documentaries, using social media to comment on scientific issues, reading about latest scientific discoveries and dining out. My daily routine involves leaving the house at around 10am for university in a Maxi Taxi; a busy day at the lab setting up and conducting experiments alongside my hand-on support Ms Nicki Cranna (research assistant) and spending the remaining time reading journal articles to keep myself up to date with the medical literature; once back at home I jump into bed for a powernap and then study late into the night. My message for others is: Strive towards your goals, just push on and never give up. Anyone who has a dream and wants to achieve something can and the disability should be no barrier. Hi, my name is Leighton I’m 5 years old. I’m from Liverpool UK, I have Duchenne muscular dystrophy. I like to live my life to the full and try anything once although I get tired easily sometimes. I love playing with my mummy, daddy and two sisters. Hopefully one day soon there will be a cure so I can carry on doing everything I enjoy in life. Comme beaucoup d’adolescents français de 13 ans, Nicolas va au collège, a des copains, des projets et cultive une mèche blonde rebelle. Mais là où ses camarades gagnent en autonomie vis à vis du cocon familial, lui voit la force de ses muscles l’abandonner un peu plus chaque jour et sa dépendance s’accentuer. Nicolas est atteint de la myopathie de Duchenne, et le fauteuil est devenu maintenant indispensable. Comme beaucoup d’enfants qui voient une part d’eux-mêmes grandir plus vite sous l’épreuve de la maladie, le regard de Nicolas sur le monde est d’une grande lucidité. “Plus il y a des gens qui t’aiment, plus c’est facile. Plus tu as le sourire aux lèvres, plus tu as envie de vivre” explique-t-il. Et ce n’est pas parce que la mobilité est de plus en plus difficile qu’il faut céder à certaines facilités. “Il faut profiter, ne pas rester chez soi à ne rien faire, devant des écrans. C’est ce que tout le monde devrait faire”, souligne-t-il. Malgré l’évolution de sa maladie, Nicolas se rend compte qu’il bénéficie d’avancées dans la prise en charge auxquelles les enfants des premiers Téléthons par exemple n’avaient pas accès. Il est donc naturel pour lui de donner son temps et son énergie pour que son engagement d’aujourd’hui puisse aider les enfants qui seront diagnostiqués dans 10 ou 20 ans. “Pour que leur vie soit meilleure que la mienne” conclut-il. Like many French teenagers his age, Nicolas, 13, goes to junior school, has friends and projects and likes to style his blond flyaway hair locks. 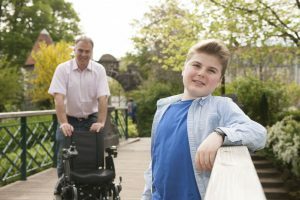 But unlike his schoolmates who gradually gain more independence from their family homes, Nicolas has to face ever-decreasing muscle strength and increasing disability and dependency. Nicolas has Duchenne muscular dystrophy and now relies solely on a wheelchair to move around. “All of my muscles will be gradually affected. I cannot walk anymore. I don’t know what will happen next. I just take things one at a time.” Instead of indulging in despair, Nicolas, with the help and support of his father, Benoît, is determined to enjoy happy moments where they can be found and to live life to the fullest. “I live in the present, I’m glad to get up every morning (…)”. Like many children who had to grow up fast because of the onset of disease, Nicolas shows great clearsightedness. “The more you’re surrounded with people who love you, the easier it is. Put a smile on your lips as often as possible and you’ll want to live to the fullest”, Nicolas explains. Moving around gets more difficult every day, but that should not lead you to take the easiest path. You’ve got to enjoy life, don’t stay home in front of the TV or computer screens. That’s what everybody should do”, Nicolas adds. Faced with progressing disease, Nicolas and his father are committed to the urgent battle against it, through their involvement in the French Telethon. They have accepted to speak out as one of the four ambassador families during the 2015 Telethon campaign. In spite of the progression of his condition, Nicolas knows that he does benefit from the advances made in the care of children with Duchenne muscular dystrophy since the first Telethon campaigns. Therefore, he believes it is only natural that he should invest time and energy to help children who will be diagnosed with the disease in 10 or 20 years from now. “For them to have better lives than mine”, he says. O meu nome é José Pedro Cardoso Rodrigues, tenho 33 anos, tenho uma Miopatia de Duchenne (uma das muitas Doenças Neuromusculares), e sou Engenheiro Informático. As Doenças Neuromusculares manifestam-se ao longo da vida, mas a maioria delas surgem na primeira infância, como no meu caso. E é na minha experiência e também nas perceções que fui tendo ao longo dos últimos 23 anos, desde o início da APN – Associação Portuguesa de Neuromusculares, que se baseia a minha história de vida. Comecei a ter os primeiros sintomas -“andar à pato”- aos 2 / 3 anos e a doença foi-me diagnosticada aos 4 anos. Fui perdendo a minha força física ao longo do tempo, deixei de correr tanto como os meus amigos, comecei a ficar mais e mais cansado, a caminhar menos e menos… Aos 9 anos tive um dos melhores dias da minha vida (penso que um 5 de Agosto), o dia em que pela primeira vez pude andar numa cadeira de rodas elétrica, o dia em que pude andar sem me cansar. O tempo foi passando, a força continuou a diminuir e pelos 10 anos deixei de andar por completo. Aos 11 anos tive uma cadeira de rodas de verticalizar e voltei a poder “andar de pé”. A força continuou a ir-se embora e comecei a ficar sem força para segurar a coluna que começou a entortar. Surgiu uma escoliose que foi aumentando até que me disseram que tinha de ser operado e fazer a fixação da coluna, aos 16 anos. Nesse dia, e apesar de saber previamente que seria necessária a operação e que iria correr tudo bem, chorei, por sentir de forma violenta e inegável a progressão da minha doença. A operação passou, fiquei uns meses sem conseguir comer pela minha mão e sem ir às aulas. Passei uns 5 meses difíceis, mas lá me consegui readaptar à nova situação, voltei a conseguir comer pela minha mão, voltei às aulas, e ainda consegui acabar o 12º ano… E agora o que fazer? Decidi-me pela Faculdade de Engenharia da Universidade do Porto, que, apesar de naquele ano não ter ainda acessibilidades, iria mudar de instalações no ano seguinte. Lá me inscrevi, correndo o risco de não conseguir frequentar as aulas. Felizmente conseguiram fazer as adaptações mínimas para que eu me pudesse integrar. Mas não fui só eu que me tive de integrar. Também o meu pai, pois que tinha sempre de me acompanhar já que eu precisava de ajuda para almoço, de ajuda para ir à casa de banho, etc. E dessa forma, com o meu pai a ir levar-me á escola, a ir almoçar comigo, e a ir-me buscar, consegui fazer o meu primeiro ano. Por causa deste acompanhamento, e porque moro a 25km do Porto, o meu pai não pôde acompanhar adequadamente a empresa que tinha e, ao fim de algum tempo, teve mesmo de a fechar, sem sequer ter direito ao fundo de desemprego. Entretanto lá acabei o curso, era Engenheiro. E agora? Emprego? Tinha feito o meu estágio na Direcção de Sistemas de Informação do Banco BPI, mas pelos mais diversos motivos, apesar de interessados no meu trabalho, não me contrataram diretamente. Ainda trabalhei para o BPI durante 1 ano através de uma empresa de trabalho temporário e após esse ano, estabeleci-me como empresário em nome individual. Neste momento trabalho para empresas que necessitem dos meus serviços. Como comecei a trabalhar, perdi todos os apoios sociais, como se tivesse deixado de precisar do apoio de alguém de um momento para o outro, ou como se ganhasse o suficiente para pagar a alguém para me acompanhar a tempo inteiro. A verdade é que não ganho. E apesar de até conseguir trabalhar, e até estar numa área financeiramente bastante aprazível, não consigo garantir a minha subsistência, pois necessito de alguém que me acompanhe, em todos os momentos, a todas as horas, todos os dias do ano. 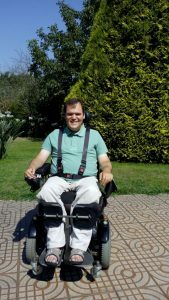 My name is José Pedro Cardoso Rodrigues, I am 33 years, I have Duchenne (one of many Neuromuscular Diseases), and I am Software Engineer. The Neuromuscular Diseases are manifested throughout life, but most of them come in early childhood, as in my case. And it is in my experience and also the perceptions that have been having over the last 23 years, since the beginning of APN – Portuguese Association of Neuromuscular that is based my life story. I started having the early symptoms – “the duck walk” – around 2/3 years and the disease I was diagnosed at age 4. I lost my physical strength over time, stopped to run as much as my friends, I began to get more and more tired, walking less and less … With 9 years I had one of the best days of my life (I think in the fifth of august), the day that for the first time I could drive an electric wheelchair, the day I could walk without getting tired. As time went on, the force continued to decrease and at the age of 10 I stopped walking altogether. At 11 years old I had a wheelchair verticalize and returned to have the capability of “standing “. The force continued to go away and I began running out of strength to hold the column which began to disform. A scoliosis had emerged and increased until, at the age of 16, they told me I had to be operated to fixing the column. On that day, and despite knowing beforehand that it would be required to do that operation and that it would be all all right, I cried because I felt violently and undeniably the progression of my disease. The operation happened, I was a few months without being able to eat by my own and without going to school. I spent about five difficult months, but there I managed to readjust to the new situation, I went back to be able to eat by myself, I returned to school, and still managed to finish the 12th grade … Then, I thought: And now what can I do? 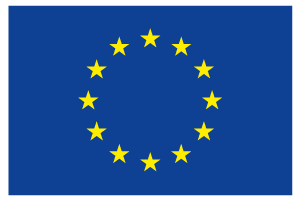 I decided by the School of Engineering, University of Porto, that although that year did not yet have accessibility, was going to change installations in the following year. I signed up despite the risk of failing to attend classes. Fortunately they managed to make minor adjustments so that I could be and feel integrated. However, it wasn’t just me that needed to adjust to this new day-to-day reality. My father needed to. I needed someone to help me, since I needed help for lunch, assistance to go to the bathroom, etc. And so, my father between taking me to school, to go to lunch with me, and go picking me after scholl, I managed to make my first year. Due to this follow-up, and because I live 25km from the Oporto city, my father could not properly follow the enterprise he had and after a while, he had to close it without even be entitled to the unemployment benefit. Nevertheless, I took my degree, and now I was engineer. And now? Job? I had my internship in the Directorate of Information Systems of BPI Bank, but for several reasons, and although they were interested in my work, they did not hire me directly. Still I worked for the BPI for 1 year through a temporary employment agency and after this year I decided to established by myself. Right now, I work for all kinds of enterprises that need my services. As I started working by myself, I lost all social benefits as if I had ceased to need for support from someone from one moment to the next, or as if I earned enough to pay someone to accompany me the whole time. The truth is, I don’t. And, although I’m able to work, and even if my field of expertise is a very pleasant area financially, I cannot guarantee my livelihood because I need someone to accompany me at all times, at all hours, every day of the year.